Yesterday several rumors floated about that iPad 2 will be released on March 2 and today invites went out to select members of the press to cover an Apple event scheduled for March 2 at San Francisco’s Yerba Buena Center for the Arts at 10:00 am. The invite, sent to Jim “The Beard” Darymple, shows the page of a calendar being torn away from an iPad, leaving little to guess as to what the events intention is. Now we’re just left to wonder what the iPad 2 specs will be. Most recent reports suggest the iPad 2 will be thinner and lighter with a more powerful CPU and GPU, but maintain the existing iPad screen resolution. 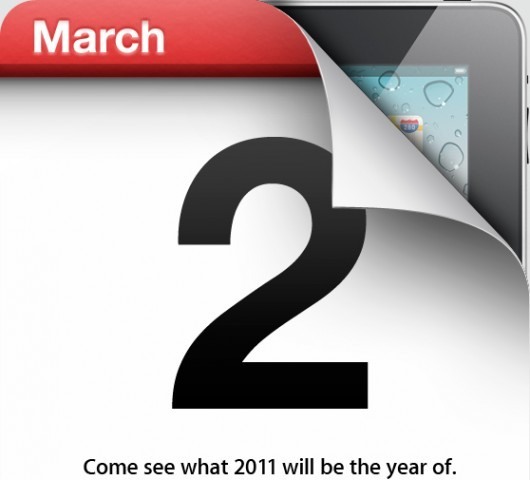 This is just a coincidence but if you look at it this way… March 2ND and the 2ND iPad! just a fun fact! By the way there are so many mock ups now that i think the ones featured on this website are the MOST accurate!